Russell Westbrook broke a tie with Wilt Chamberlain, who had nine straight triple-doubles in 1968, by finishing with 21 points, 14 rebounds and 11 assists. 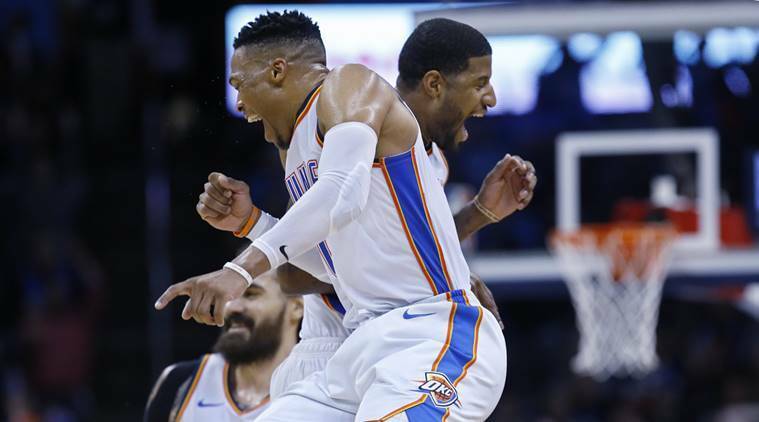 Russell Westbrook set an NBA record with his 10th straight triple-double, Paul George scored 47 points, and the Oklahoma City Thunder beat the Portland Trail Blazers 120-111 on Monday night. Westbrook had five assists heading into the fourth, and he re-entered the game after a rest with 9:36 remaining. He got his first assist of the quarter with 6:54 left, but was up to his ninth with 4:57 to play. Trail Blazers: CJ McCollum was called for a technical in the second quarter. … McCollum shot 4 for 15 and Lillard 1 for 10 in the first half. … Portland shot 33.3 percent in the first half.